Silahkan klik tulisan atau gambar untuk lanjut membaca Great mac and cheese? The road is paved with Velveeta. For a couple of years in college and beyond, I was a vegetarian. The reasoning is a little hazy to me now; I believe it had something to do with a drunken viewing of "City Slickers" and a disproportionate emotional response to the prospect of the slaughter of the baby cow Norman. The point is, I was the laziest vegetarian ever. My diet consisted of my childhood favorite, Kraft macaroni and cheese, and when I had an extra buck or two from selling plasma, I sprang for Velveeta. Something about that luxuriant orange ooze just screamed maturity to me. Eventually, I expanded my palate to include more exotic fare — protein, say, and complex carbohydrates. When I hungered for mac and cheese, I ordered out, but I’d never actually made the dish from scratch until I got Ellen Brown’s new book, “Mac & Cheese” (Running Press, $20) in the mail. Brown is a comfort food queen, and she started noticing luxury versions of the homey standard popping up on menus everywhere she went. So she used those restaurants for her inspiration, adapting 80 recipes, from the classic to the kitschy (Philly cheesesteak mac and cheese!) for the home chef, plus mac and cheese spring rolls, mini-mac canapes and a half-dozen desserts she developed herself, including rum raisin orzo pudding. There are two guiding principles behind terrific mac and cheese: a combination of cheeses, never just one, and a high proportion of cheese to everything else. The type of pasta isn’t as important, so long as it’s short and dried; fresh pasta will collapse under a cheese sauce. Ridges, spirals and tubes help the sauce cling to the noodles. Another important tip for baked mac and cheese: The dish should be almost soupy before it’s popped into the oven, because even partially cooked pasta will continue to sop up sauce. I tested the Dumac & Cheese, adapted from Brooklyn’s DuMont Restaurant, a baked version with Gruyère and cheddar, and while the flavors were right on target, the consistency was a bit grainy. I had the same issue with a Los Angeles Times recipe billed as “really the best-ever mac ’n’ cheese,” which was similar, but featured dry mustard and cayenne and a milder cheddar. Brown ventures that I added the cheese too quickly; the internet agrees. Still, I hadn’t found the transcendental mac and cheese I was seeking. Then I found a recipe in "Fire in My Belly: Real Cooking," by former "Top Chef" contestant Kevin Gillespie, the Georgia-born chef who resembled a tattooed, ginger teddy bear and had a seemingly mystical connection with pork belly. If the cookbook is any indication, he’s the real deal: a humble, cook-from-the-heart sort of chef who has the upmost respect for Southern foodways, but isn’t afraid to pair fried green tomatoes with spicy raita. 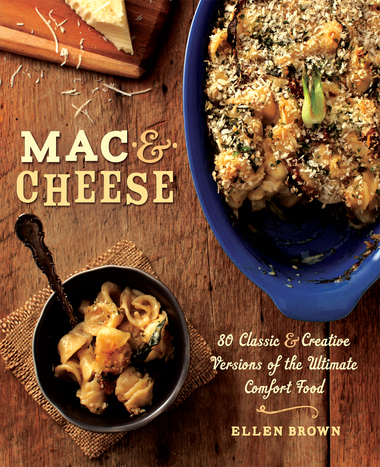 The book offers a "gussied-up" mac and cheese that Gillespie developed after struggling with grainy Mornay sauces. One day, he spotted the shelf-staple cheese in the grocery aisle and decided to try it, along with smoked cheddar and Parrano, a semi-firm, nutty cheese from the Gouda family. "Velveeta makes the creaminest, cheesiest mac and cheese you’ve ever tasted," he writes. "I add sauteed andouille sausage and top the whole thing with crumbled potato chips because that’s just badass." I can’t fully vouch for that because I skipped the andouille (I added some crushed red pepper to give it some bite) but I loved the smoked Cheddar and the salty crunch of crumbled Utz. The Velveeta gave did give the dish a super-smooth texture I had been missing, but it left a coating inside my mouth that was not entirely pleasant. I cut the Velveeta down from 1 pound to ½ pound (the recipe serves eight) on my next outing and boosted the smoked cheddar and Parrano. Mac and cheese nirvana. Surrender to the Velveeta. 1. Preheat the oven to 375 degrees. Butter a 3-quart baking dish and set aside. 2. Bring a large pot of water to a rapid boil. Add the salt and stir to dissolve. Add the pasta and cook just until tender, yet still quite chewy in the center (a little under the al dente stage). Drain the pasta in a colander and set aside. 3. While the pasta cooks, line a plate with a double layer of paper towels. Squeeze the sausage from the casing, then quarter it lengthwise and cut it crosswise into ¼-inch pieces. Heat an 8-inch skillet over medium-high heat, add the sausage pieces and cook until browned around the edges, about 3 minutes. Using a slotted spoon, transfer the sausage to the paper towels to drain. 4. In a Dutch oven, heat the cream to a simmer over medium-high heat. Cut the heat down to low, add the Velveeta and stir until it melts. Add the sausage, cheddar, and Parrano, stirring until the cheese is completely melted. Pull the pot from the heat and fold in the cooked pasta. Pour the pasta into the baking dish and top with the crumbled potato chips. 5. Bake until bubbly and browned around the edges, about 20 minutes. Pull the dish from the oven and let the sauce set up for at least 5 minutes before serving.